Allegra Boverman/Gloucester Daily Times. 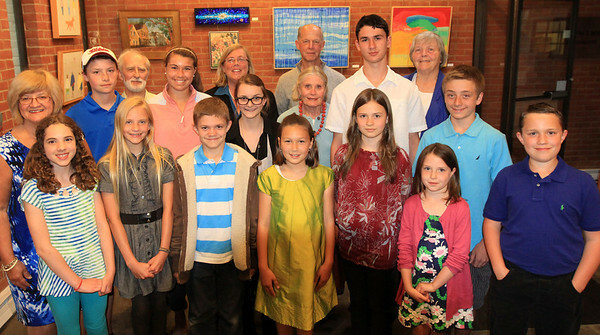 Poetry without Paper winners and judges, at Sawyer Free Library's poetry reading on Thursday evening. Front row, from left are: Sophia Palumbo, Sedona Gillard, Kristian Neal, Mila Barry, Willa Brosnihan, Grace Costa, and Gabriel Bradshaw. Back row, from left are: Carol Gray, Mark Turner, Richard Sloane, Grace Papp, Mayor Carolyn Kirk, Jordan Westling, Jill Carter, Sage Walcott, Matthew Ciarametaro, Carol Ackerman, and Jack Kelly.